Not quite true; it 'inverts' the colours of Twitter inclusions (on Chrome; haven't tried FF). Other than that, concur. Not with me. I'm using Chrome and I turn on and off the app and no change to the picture. I played with the app setting, must have picked the right combo. I love it, do a lot of dark time reading. Not going back to default. 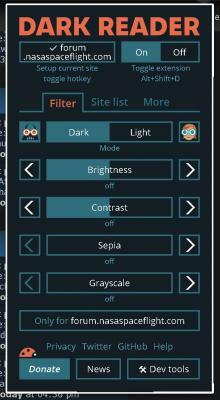 Here are the settings I use for this site.